Looking for advice on how best to spend your mobile advertising budget? Well, I have good and not-so-good news for you. The not-so-good news is that there is no one answer for all marketers but the good news is that I have some great options for you based on some of the trends we see in mobile advertising. We published a post titled “3 Predictions For Mobile Advertising Not To Ignore” last year and thought it would be good to go into more detail about some trending areas that look set to go big in the next couple of years. By understanding your audience and what devices they are most likely to be reading your content on, you will be able to make the best decision in which way to take your advertising strategy forward in the mobile era. Advertising has always been a strategic weapon, needing months rather than weeks for its real effectiveness to be appreciated. In today’s mobile world there is an urgency for all online publishers to keep up with the changing technologies. To do this you have to be creative and hitting the trends just before they hit the masses. There is no denying it, advertising budgets for mobile have gone through the roof; eMarketer has estimated that mobile advertising budgets will reach $158.55 billion by 2018. By this point, mobile ad spend will be more than 50% of all worldwide digital advertising. If you were wondering why you need to know about mobile advertising trends, I hope that last paragraph and clip just cleared it up for you. So let’s get down to it. In this first section I’ll give you an overview of mobile advertising, including networks, CPM estimates and ad sizes. I’ll dive into the different formats for advertising on mobiles after that but keep reading, it will be worth it. Picking the best mobile ad networks is crucial to running successful campaigns in mobile devices. They are quite difficult to choose from as they offer very similar services and CPMs. To make it slightly easier, here are three of the top mobile ad networks that offer publishers the highest CPMs with the best quality advertisers. SMAATO – only works on mobile devices, this ad network received a substantial investment in 2014 ($25 million to be exact) from a powerful online publisher in Singapore. SMAATO is used in over 230 countries with an aggregated 90 leading ad networks in their system. Google AdMob – Not surprisingly, this is one of the largest and most popular mobile ad networks around. It enables a diverse selection of ad formats, including banners, interactive and custom search. AdMob is also integrated with Adsense which allows you to really analyze the effect of your campaign on apps. With over 650,000 apps using AdMob, it’s no wonder advertisers are using it. MobFox – Specifically for publishers, MobFox offers a number of excellent features that help optimize mobile advertising. Publishers can implement and manage directly sold campaigns and their ad networks using this tool. In addition, MobFox offers services such as native advertising in apps and an excellent RTB exchange platform with connections to over a 100 demand partners. imonomy – imonomy is the leading in-image technology company that blends Big Data analysis, behavioral analysis and contextual analysis to deliver the most relevant and engaging ads to consumers. We have powerful mobile advertising solutions, find out more here. In the last two years we have seen mobile CPMs rise, which has increased the budget spend in this space for many publishers. There are a number of factors to explain this increase and by understanding them, you can feel more confident in spending more on mobile. There has been a leap in the development of mobile ad formats, and this has done wonders for CPMs. The growing number of ads formats available on mobile it has given publishers even more opportunities to bring in new revenue. 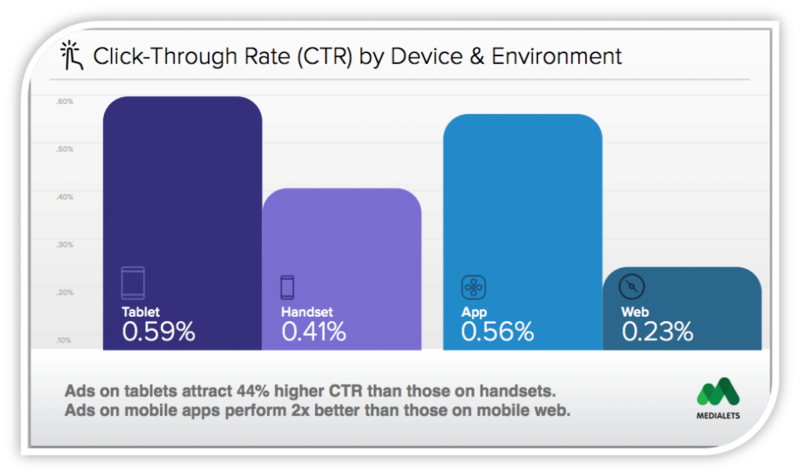 To add to this, the more mobile friendly and responsive publishers’ sites are, the better their ads perform. 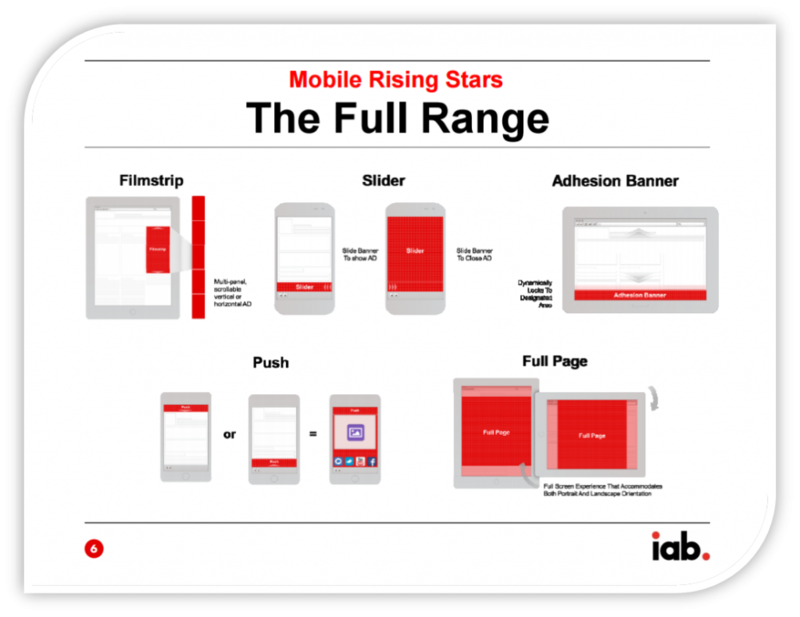 To visually help, here is the full range taken from IAB’s Rising Stars series. Filmstrip – contains multiple panels that the user can scroll through; combining storytelling with non interruptive advertising, this ad format is very popular in tablets. Slider – a slider bar sits on the bottom of your browser and only opens up the ad when the user interacts with it. By opening the slider the users screen is filled with the content and they can easily navigate back, this is great for mobile phone ads. Adhesion banner – this type of advert is always seen on the bottom of the device and be responsive to the users interactions. It can change according to the position the mobile device is held. Push – if you are looking for more social shares on your product you might want to consider push formats. This automatically connects the users social accounts and enables them to share the content. Great for event advertisements or news stories. Full Page – the full page ad format will fill the user’s screen. Implement this format carefully carefully, as you don’t want to keep people from reading your content. Many publishers report higher CPMs when their ad networks make use of programmatic buying technology. Aside from cost savings, programmatic advertising technology has made transactions and ad operations much more efficient for publishers, streamlining the process which results in better placed ads and improving CPMs in general. Facebook has revolutionized advertising, particularly mobile advertising on its platform. It recently rolled out its Canvas mobile ad format which offers a compelling way to reach consumers with engaging ads. Making sure your ads are responsive is a huge challenge in this advancing mobile world. Responsive advertisements adapt to whatever platform it is viewed on, whether its desktop, mobile, tablet or other. The diversity of new devices and platforms makes it challenging to keep up with all the different sizes and layouts. For example, consider the emerging wearables trend. I personally love this niche mobile advertising space and it’s not just me. Business Insider predicted that mobile video ad spend to reach $13.3 billion, which will be more than half of all online video ad spending, by 2020. Mobile video advertising is what its name suggests. It is the combination of video ads and mobile content, whether it’s text, video or image based. The popularity of YouTube and, more recently, Facebook Video has prompted the industry to develop effective mobile monetization options to better meet the growing market. Just as HTML enables web browsers to display websites from any web server, VAST enables video players to display ads from any video ad server. I suggest reading the report to fully appreciate the technical dimensions of mobile video ads. This type of technology is helping publishers feel more comfortable in directing their premium inventory towards programmatic platforms and opening the gateway for mobile advertising. The key to monetizing your mobile strategy is to get on board with mobile advertising. Millennial Media released a Year-in-Review Smart Report that highlighted how video ads produced 5 times the number of engagements in comparison to standard banners. Not surprisingly, mobile video ad spend has also increased at a similar rate; raising the bar for online publishers when it comes to expectations, preparation and implementation. A substantial portion of mobile ad spend has been dedicated to Facebook ad purchases. 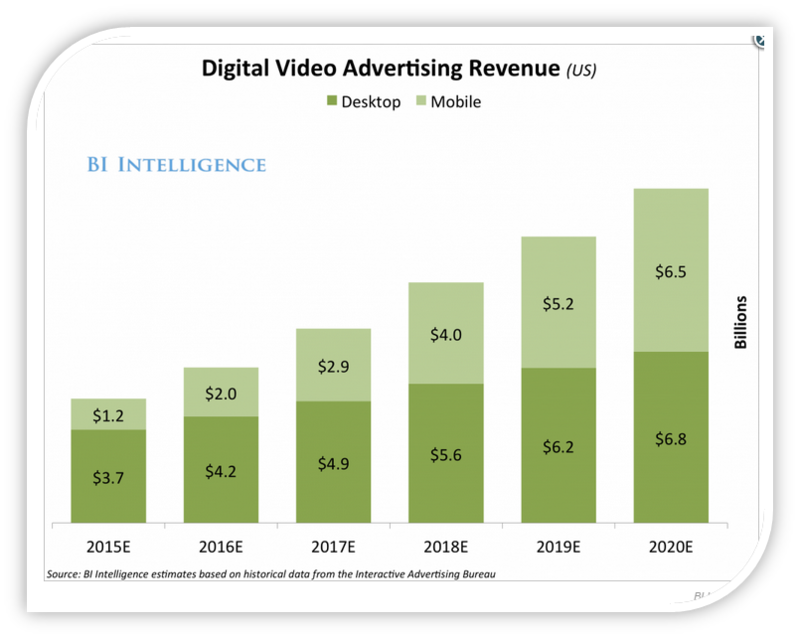 Now everyone is talking about how mobile video ads are going to be a major factor in their revenue. If predictions are correct, by 2016 their global revenue from mobiles will be $7.39billion (a mere 75% of their total income). Note: At the moment, video ads are generally focused on brand awareness, and the big fish want to feature their ads only on premium content. That said, user generated content is growing as a monetization option, although with so much attention on mobile advertising we may well see far more video ads sooner than we would have thought just a year ago. The digital world has been constantly trying to balance both the user’s needs and finance the companies that provide the content. From this, dynamic advertising was born. This strategy is extremely useful for the mobile era, especially with geo location technology being an extremely valuable asset to mobile advertising. Dynamic advertising (often used with the word ‘creative’) is essentially personalized advertising. This shouldn’t be confused with native advertising, where the adverts blend in with the content to make your browsing experience as clean as possible. What dynamic advertising does is basically give the reader a personalized advertising experience that is unique to them. By using cookies, tracking data, date and location, ads can be viewed by people who are more likely to be interested in the product and therefore increase an advertiser’s ROI. I don’t know about you but I prefer ads that are relevant to me and not advertising generic products. I’m sure you’ll agree that personalized ads are more relevant and we’re more likely to engage with them and convert as customers. We all know that in the advertising world, the ones that make a connection with the viewers are the ones that succeed. Remember the Always #LikeAGirl campaign? I loved it. Dynamic ads are designed to show online readers selections of their current interests, which can be based on gender, location and searching habits. The more personal an ad, the better the CTR and likelihood of a conversion. Note: I am a big fan of native, it has made the web seems like a tidier place. What I now want to see is native advertising that is dynamic in its content. Imagine that, instead of a general top 5 news stories column, you can have a list that has taken into consideration a whole number of your personal factors and correlated it with people that are similar to you. Now that would be a top 5 I would read. If you are looking to optimize the advertising space both on the browser and mobile version of your site, you might want to consider ads powered by in-image technology. Effective in-image technology blends Big Data analysis, behavioral analysis and contextual analysis to deliver the most relevant and engaging ads to consumers. The results are ads that are contextually relevant, personalized based on insights into your customers and higher, incremental revenues for publishers. the best offers from advertisers who want to place their ads on your site. Images are also the most engaging aspect of an article. By places ads on images you are increasing the likelihood that consumers will click on the ads. What’s more, when the ad content matches the web page content, consumers will be more inclined to actually pay attention to it. We have seen noticeably higher CTRs with publishers who use our in-image ad products. If you don’t have an app for your publication you might want to start considering it, not only for the accessibility and easy browsing for mobile users, but also to increase your revenue. An article in AdAge pointed out that most people prefer to have a free app that is supported by ads, which has opened up the potential for in-app advertising. I am not surprised that Medialets found that mobile advertising has been much more successful when used in conjunction with mobile applications. In-app ads work in a similar way to native, to make them effective they need to be an integral part of the app and not break the attention of the user. Robert Weber wrote a great article on The Next Web, it’s a detailed look at how emotions, movement, format variety and other factors impact on your mobile app ad. I can recommend you it read if you are interested in incorporating in-app ads in your future marketing strategies. If you were wondering why your apps were free, well it’s all thanks to in-app advertising. These are basically tailor made advertisements that are displayed in applications and are responsive to various mobile devices. I can think of a number of reasons why mobile ads work better in apps. If you are developing a specific app for your site it is going to be tailored to your content. Developers can ensure that users have the best ad experience that doesn’t interfere with their enjoyment of the app. It isn’t practical implementing all the solutions I’ve outlined but even small to medium-sized publishers can make huge strides with many of these monetization options. Top online publishers will be aiming to optimize every angle for mobile users and it would be wise to keep up. Medium sized publishers can pick 1–2 areas they want to develop and focus on those for their Q3 advertising strategy. The best place to start is to make sure your site is mobile friendly. I put together some useful pointers for online publishers here during the Mobilegeddon frenzy, just scroll down to the bottom of the article. My personal bet for the next 6 months is mobile video ads. Publishers should start working with automated systems that can make the placement of video ads much easier and efficient. What do you think? Update: This article was updated on 2016-03-21 to improve readability and refresh links which had since expired.